Welcome to the Albarino, one of the few homes in Trilogy that offer a private gated entrance - the ultimate in exclusivity. Built in 2016, this 3 bedroom, 3.5 bath 2,810 sq. ft. SOLAR home with over $300,000 in designer upgrades is resort living at its best. Situated on a prime vineyard view lot, you're immediately immersed in a wine country atmosphere. When you walk inside it's spacious with high ceilings, natural light and beautiful oil-rubbed wood floors. Open concept living embraces you as you navigate through the multiple spaces with limitless entertaining options. The kitchen is inviting with an oversized, quartz island, white cabinets, tile backsplash, GE stainless appliances, and walk-in pantry. The great/dining room has a double-sided fireplace; walls of glass with incredible views, multiple seating areas, and home theater surround sound. In the master suite you are welcomed with vineyard views from the extended sitting area. The master bath has a garden tub; glass enclosed tiled shower, quartz countertop sinks, tiled floors and a walk-in closet. The two guest bedrooms offer full baths - one even has a walk-in closet. The laundry/smart space has plenty of cabinets for extra storage. 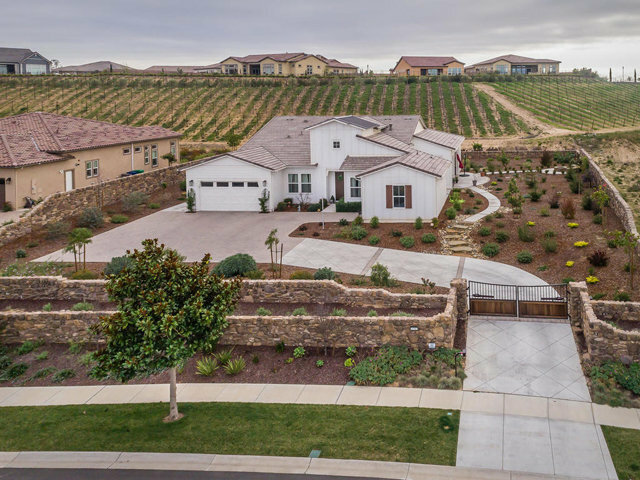 Heading outside to the covered wrap around backyard you won't believe your eyes from the vineyard at your feet to the outdoor fireplace room, and separate built-in fire pit - it's a dream come true. This home is breathtaking, and best of all it's in Trilogy.